I was asked by Marc Nathan to do the cover of the Baltimore Comic Con program Guide this year! 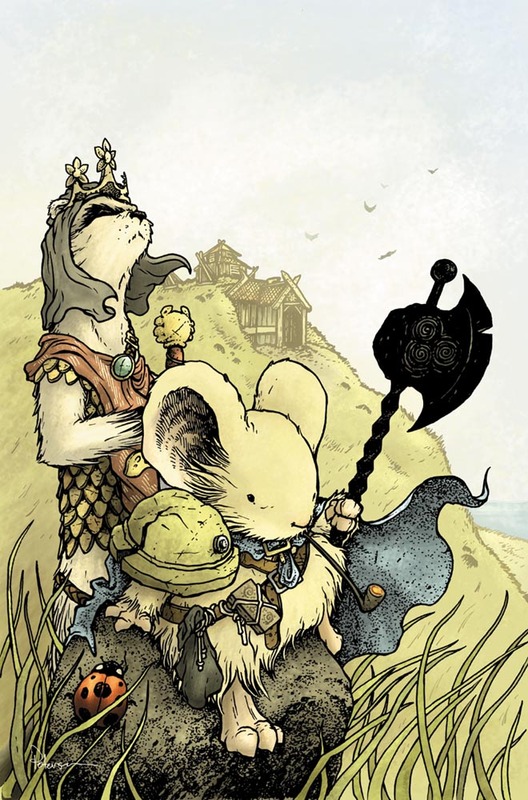 It's huge honor for me and Mouse Guard. The Baltimore show is one of my favorite of the year. It's a show about storytelling and art. It has a very strong artist alley, and is organized by people who really care about a good convention where creators can meet fans and nothing else gets in the way. Here is the final artwork sans-logo & text, but below I run through the process in making the cover image. 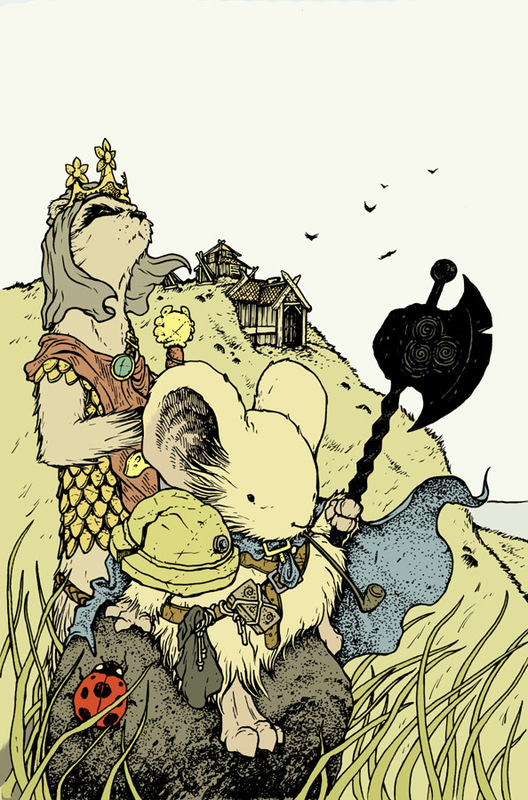 Sketch: I considered doing a Baltimore themed piece (something including a piece of Baltimore architecture or an Oriole) but I opted instead for a pure Mouse Guard piece, and specifically a Black Axe themed piece. I had a rough compsition in my head, but I figured I'd worry about the composition after I had a few figures draw that I could move around in photoshop within the confines of the cover's dimensions. 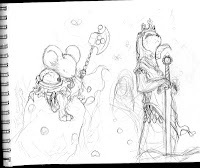 Celanawe and Luthebon were drawn in my sketchbook along with some circles to represent ladybugs (which seem to be a repeating motif for Celanawe with the Axe). Composition: Marc warned me that the cover not only needed room for the con-logo and text, but also for lots of signatures. People like to get their program signed, so as I worked on getting the figures in a pleasing arrangement, I also had to leave plenty of sky and open grassy area for signatures. The architecture of Ildur Hall in the background is a photo of the model I built of it. The yellow frame represents the 'bleed' in printing. If the artwork is going to go off the edge of the finished book, the artwork needs to be extended beyond that cut so that there is no chance of a white edge if the cut is a bit off register. I don't intend anything inside that yellow edge to be seen, but I have to extend the artwork out to that point for the bleed. Inks: The layout seen above is then printed out (at 10.5" x 16") and taped to the back of a sheet of bristol board. 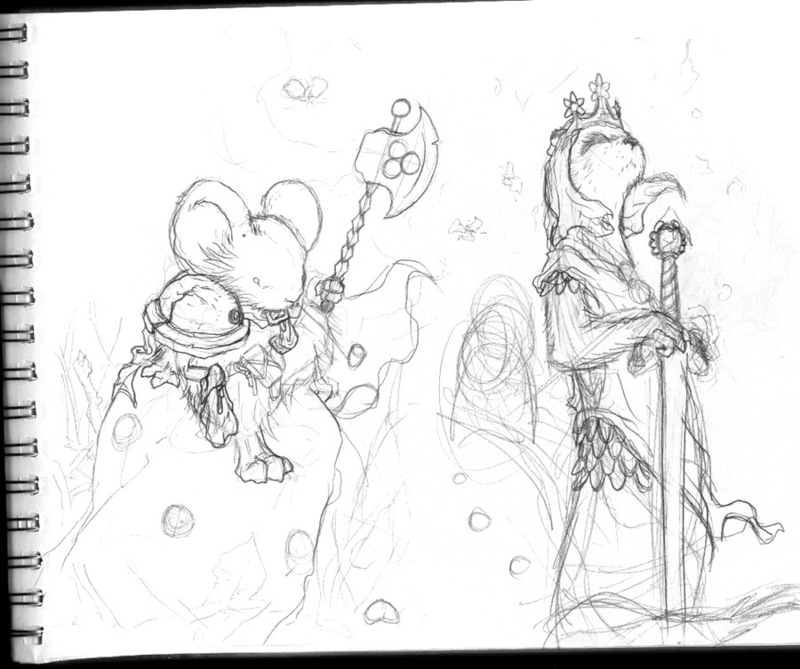 On a large lightbox, I can see through the bristol board and use the layout as I ink in the final drawing. I ink with Copic Multi Liners (the 0.7 nib mainly). A lot of the work is done in this stage, I didn't draw in all the blades of grass or the texture on the rock when I was penciling the rough. It's in the inks that I concern myself with the rendering of textures and creating shading and dark spots that draw your eye through the artwork. Flat color: After the inks are done, it's time to scan the piece and begin coloring it. This stage is called 'flatting' because you are establishing the breaks of different color areas solely with flat color. In photoshop, the line-work sits on the top most layer with a mode turned on that pretends the black pixels are opaque while the white areas are transparent (like an overhead projector slide from school...or at least when I was in school). All the color layers go below that. 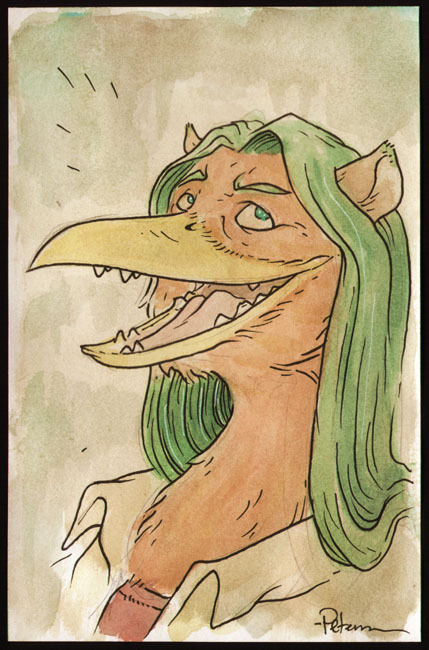 For color choices, I was mostly able to just eyedropper up colors from the Black Axe issues where Celanawe, Luthebon, & Ildur Hall appear...but in the rendering stage, I did make adjustments o those colors to make this piece work as a whole on it's own. Final rendering: Using tools called Dodge & Burn (terms from photographic exposure developing techniques) to lighten and darken the flat colors, I shade highlight and render the image. 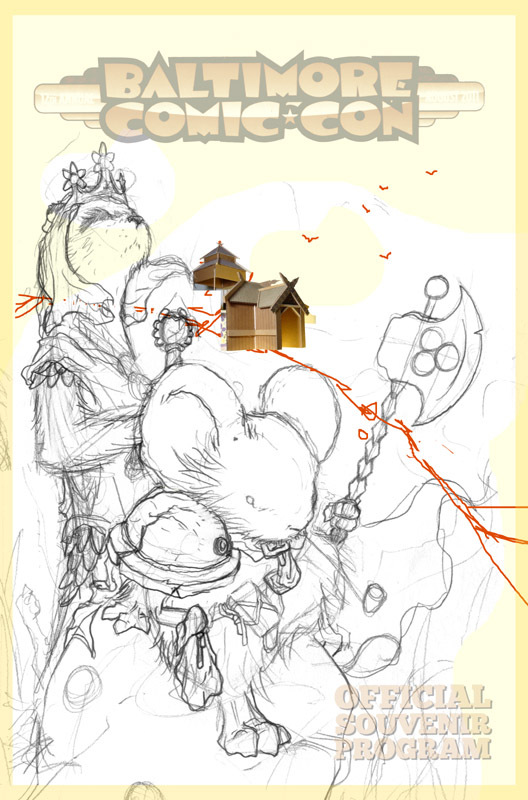 To push the hall and the hill back away from the figures, I added a color hold to their linework. A color hold is just a term for making the black inkwork a color rather than black (usually a slightly darker color of the thing it is an outline for). So that's the final cover art! I look forward to seeing fans stop by with it at the Baltimore Comic con in a few weeks! 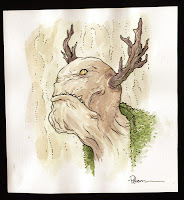 Last week's Watercolor Wednesday first piece was an original forest spirit type creature. 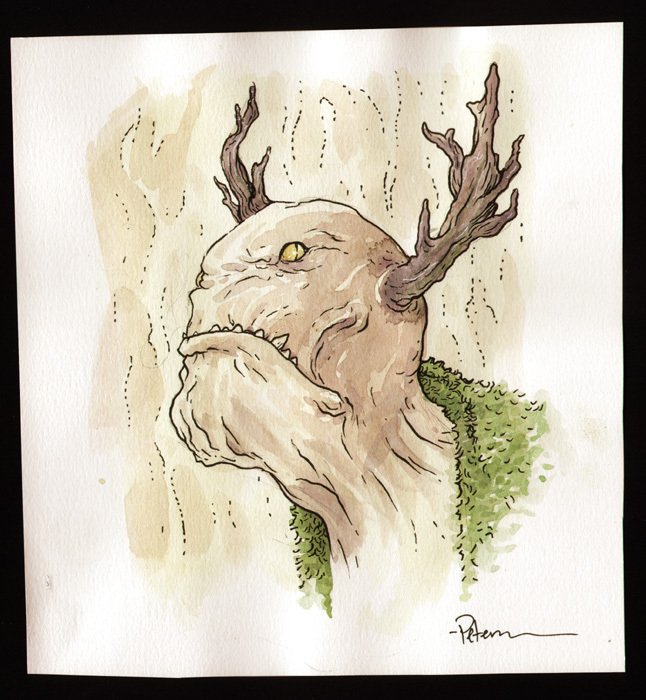 Here is a better look at the piece in case you missed it. The wrinkles on his face and his small predator eyes were inspired by seeing a photo of an old shark. Thank you - that was wonderful to see. David, you're coming over to the UK thought bubble con in november, will you be there both the saturday and sunday? I heard about the Baltimore Comic Con. If it's as good as you describe it, I might have to go there one year.